The School Readiness Program is state and federally funded and designed to offer child care financial assistance to low-income families who are working or full time students. The program prepares children to become ready for school, assists families in becoming financially self-sufficient, and provides parents with information about quality early learning and child development. School Readiness Contracts must now be completed on the Office of Early Learning (OEL) Provider Portal. 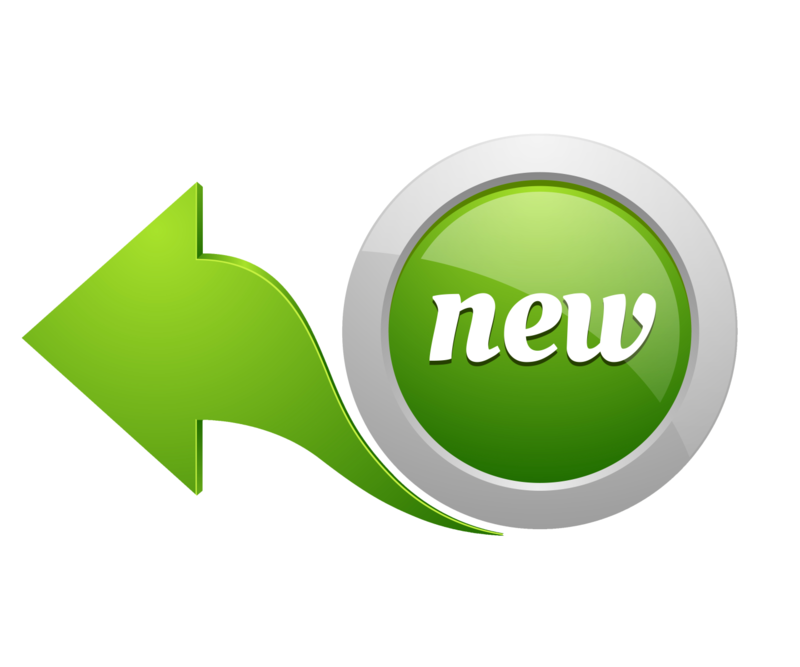 You can find detailed instructions and helpful video tutorials on the features and use of the portal at the link here. When you are a School Readiness Provider, it is important to know the responsibilities outlined in the Provider Contract and to be up to date on any new regulations. Please review the entire contract to ensure you are in full compliance with all of aspects of the contract. Provider contact the Coalition's Provider Services team about becoming a School Readiness provider. Provider submits completed W-9, Public Rate Sheet, license or exemption letter, and contact information to Provider Services. Provider creates their account and completes the applicable School Readiness contract with attachments/amendments, uploading all additional documentation as required within the ELCPBC Provider Portal. Coalition's Provider Services team reviews supporting documentation and certifies School Readiness contract. Provider is eligible to accept School Readiness funded enrollments. Registered Family Child Care - Cares for no more than 6 children based on state ratio guidelines. Licensed Large Family Child Care - Cares for no more than 12 children based on state ratio guidelines; has one employee/assistant. Licensed Child Care Center - Cares for children based on state ratio guidelines, with capacity calculated by square footage. Licensed Exempt Child Care Center - Cares for children based on state ratio guidelines; either a school-age program only, or is an accredited religious exempt provider. Public School - Meets guidelines set forth by the Department of Education (DOE). How will I know what my city or county requires as far as a Business Tax Certificate or License? Please contact your city or county and ask what is required to operate a business within city/county limits. If I only want to watch a few children, do I really have to get liability insurance? What does "additional insured" mean on the liability certificate and how do I update that? Yes. Liability insurance is a requirement of participating in the School Readiness program and a requirement of the School Readiness agreement/contract. The Early Learning Coalition of Palm Beach County, Inc. (ELCPBC) has additional coverage if there is any issue that results in a claim of liability. You should contact your insurance provider for validation and to add "Early Learning Coalition of Palm Beach County" as an additional insured on your certificate prior to submitting this documentation. What if I want to use my own developed curriculum? The Florida Officer of Early Learning (OEL) will review all curricula materials. For more information on how to submit your curriculum to OEL, please visit their School Readiness (SR) curriculum page here or feel free to contact our Provider Warmline at 561-214-7426. I only have weekly rates. How do I determine my daily rate? For your School Readiness or Children's Services Council (CSC) Scholarship agreements/contracts, please take the weekly rate and divide it by five to determine the daily rate. If you have additional questions regarding the rates, please feel free to contact our Provider Services team. Record attendance online in the Office of Early Learning (OEL) Provider Portal. Submit attendance sheet to the Coalition no later than the 3rd Business Day of the month. Provider submits any extended absence documentation to Coalition's Reimbursement team. Payment is released to providers on the 16th of the month, or the business day prior (if on a holiday or weekend). Providers can select the option of having payment issued via direct deposit by completing the Electronic Funds Transfer (EFT) Authorization Form. Payment reports are uploaded for the provider to review by the 18th of the month. Providers have 60 days after payment reports are issued to report any discrepancies to the Coalition. 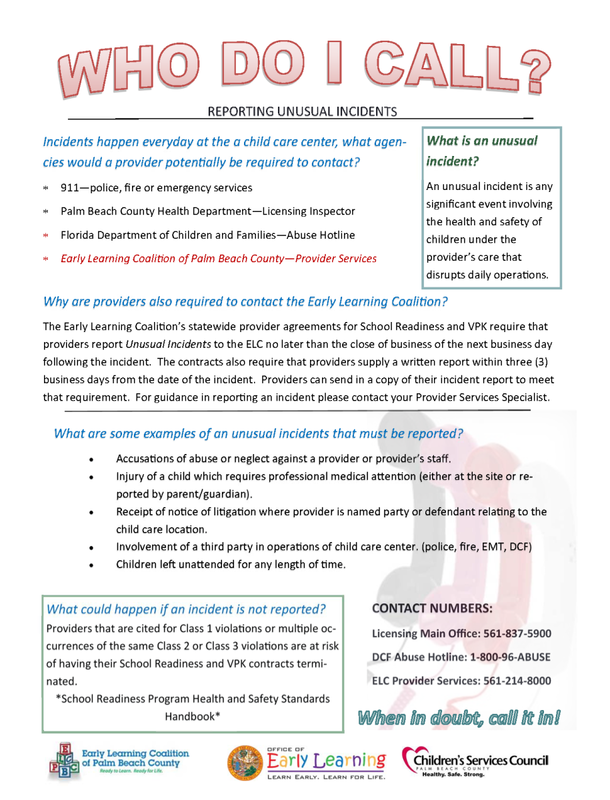 Per s. 1002.87(8), F.S., if an enrolled child is absent for five (5) consecutive scheduled days with no contact from the parent, then the child care provider must notify the Early Learning Coalition of Palm Beach County by the close of business on the 5th day of absence. To submit the above form or other written notification, please click here to upload electronically via Box. Per s. 39.604(4)(b)(1), F.S., is a Protective Services child is absent for one (1) day with no contact from the parent or caregiver by the end of the day; or has had seven (7) consecutive excused absences, then the child care provider must notify the Early Learning Coalition of Palm Beach County by the end of the next business day. Based on Florida Rules 6M-4.500(1)(c), F.A.C. - Child Attendance and Provider Reimbursements, Statewide SR Contract Items 20 and 21, as well as the Statewide VPK Contract Item 36: A parent, legal guardian, authorized person (18 years or older) must sign-in and sign-out each child daily. Acquiring these signatures is the responsibility of each child care provider, to also include specific time for sign-in and sign-out for each date of care. Based on Florida Rules 6M-4.720(2)(b), every School Readiness (SR) child must be screened, using the Ages and Stages Questionnaire (ASQ), within 45-days of enrollment. The ASQ-3 is the specific version of the tool utilized by ELCPBC, in addition to the Ages and Stages Questionnaire: Social-Emotional (ASQ-SE). Both, the ASQ-3 and ASQ-SE, are parent-completed screening tools. The ASQ-3 assists in tracking each child’s development in the areas of communication, gross motor, fine motor, problem solving, and personal-social. The ASQ-SE assists in tracking each child’s social-emotional development in the areas of self-regulation, compliance, social-communication, adaptive functioning, autonomy, affect, and interaction with people. See our Provider Child Development page for more information on our Developmental Screening department. All providers caring for School Readiness children must maintain the Department of Children and Families (DCF) staff to child ratios at all times. For more information on staff to child ratios, please click here to see the Florida Office of Early Learning's School Readiness Program Health and Safety Standards Handbook(s). Parent fees are designated by the Florida Administrative Code (FAC) as a requirement for receiving services unless waived. In the event that a parent does not honor the obligation to pay the parent fees, it will be difficult to transfer their child to a different child care provider. It is recommended that all parents receive complete information regarding parent fees and/or the possibility of a tuition difference during enrollment and eligibility. We encourage all providers to provide the details of the difference of tuition prior to enrollment.